I always marvel when a person is able to transform the most rustic form of paper into something sophisticated. 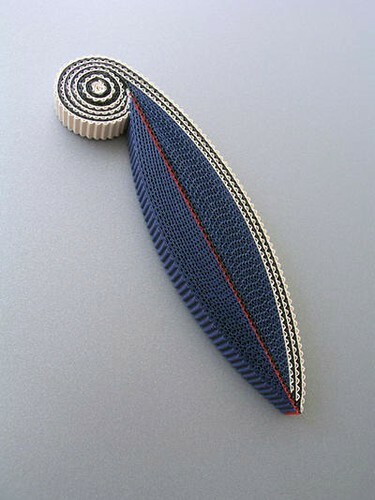 Anne Finlay of Scotland is one of those people... she creates fine sculptural brooches from corrugated cardboard. To my way of thinking, cardboard jewelry often looks... well, how do I put this tactfully?... homespun, but Anne's pieces have flair due to their geometric patterns, rich colors, and modern lines. Anne returned to the studio after a long break and was ready to try something completely new after previously working with plastics. She enjoys the many possibilities paper provides, its flexibility, and the slowness of the process as she glues and shapes the many layers of each piece. See more examples of Anne's paper jewelry at The Scottish Gallery [edit: artist is not currently listed] You might also find it interesting to see her acrylic and PVC jewelry here... again, very modern and sculptural. Oh, and there's still time to enter the generous Le Papier Studio giveaway. Ends tomorrow, Saturday at 11:59 PM EST. Good luck! Gorgeous Ann. Really really beautiful collection in her gallery. Thanks for your facebook finds Ann, With no time for facebook I seem to have missed most of them. Hi J and D, If you mean quilling patterns, there are several on my blog tutorials list: http://www.allthingspaper.net/p/tutorials.html. You might also do a Google search for "Christmas quilling patterns". quilling.blogspot.com and whimsiquills.com both show several cute ideas. what beautiful creations quillings I love it! wonderfl creative thought and lovely work. Whoa, that is some precision cutting...no matter how careful I am my paper always ends up a half a millimeter thicker or thinner...with regular quilling its annoying but doable, how does she get all the slices so even?! I know what you mean Kim, and something else that puzzles me is how does she so successfully separate the crimping inside corrugated cardboard from the backing pieces on each side?! Ann, I love the crimped jewellery by Anne Finlay. Lovely modern designs. I love her work, it's so unique!